April 8, 2019 – Our time machine welcomes aboard book lovers live at the Meet the Author Series presented by Mayda Bosco at the Closter Public Library in New Jersey. Together, we travel back to the Brooklyn and Massachusetts of the pre- and post-World War 2 era, for a tale of sibling strife that’s as old as Cain and Abel. 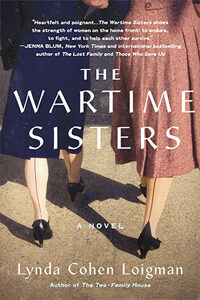 This is the engaging, absorbing story of two very different sisters, Ruth and Millie Kaplan. Raised in Brooklyn, each carries a hope chest full of hurt and secrets from their childhood. Although they try their best to escape it, they’re forced together again as adults at the Springfield Armory, where the Arsenal of Democracy gears up to support the war effort. Many years have passed, but marriages, husbands, and even kids of their own can’t stop them from sliding right back into the sandbox of roles forged in childhood. Weaving this tale of hurt feelings, estrangement, and siblings who are just running wildly different emotional operating systems, is Lynda Cohen Loigman, author of The Wartime Sisters: A Novel . It’s the sophomore offering after her critically acclaimed debut The Two-Family House, a 2016 nominee for the Goodreads Choice Awards in Historical Fiction. Visit our guest LyndaCohenLoigman.com, follow her @LyndaLoigman on Twitter or LLoigman on Instagram, and toss a like to her author Facebook page.